G3 designed the Ruby AT Binding with female (and bantam weight males) in mind. This DIN settings run from 5-10 allowing most females to ski the binding toward the middle of the range where the spring tension is most accurate. In addition, the toe piece has been built with a low-force throw that translates into less effort to open the jaws and position your boot in the pins. The Ruby AT binding provides a lightweight stroll to the top of the mountain and trustworthy attachment to your skis on the way back down. Tech Note: The Ruby is based on the Dynafit binding system so your boots must be Dynafit compatible. $Materials: Toe jaws, chassis, and heel post are forged aerospace aluminum. Fiber reinforced binding mounting base plates. 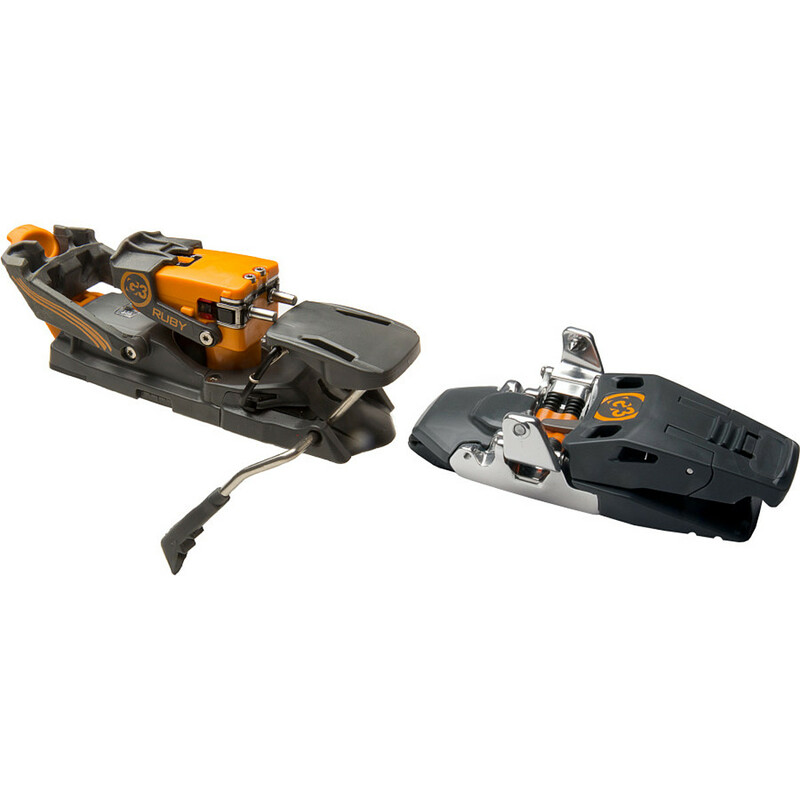 The G3 Ruby is a women's tech binding that has the low weight that tech bindings are valued for, but is much less fussy to use.-- Low-force toe lever requires less force to open the toe jaws. Always nice, but especially nice in deep snow-- Switching modes is easily done, and does not require taking the boot out of the binding-- Heel elevator is easily deployed using a ski pole-- While there is some debate about where a binding needs to be installed for a women skier, there is no debating the value of the Ruby's adjustable mounting plate. Move the position yourself until you find your own style-- Binding can be removed from mounting plate to create a smaller package for airline travel-- Mounting plates are available separately. One binding can be used on several skis! Material	 Forged aerospace aluminum toe-jaws, chassis, and heel-post. Fibre reinforced binding mounting base plates. The G3 Ruby is not available from the stores we monitor. It was last seen January 9, 2018	at Backcountry.com.